Larry with Tennessee Holster, has finally found the time to make one of his heavy leather, adjustable cant IWB holsters for the Bersa Thunder 380. It is a very nice looking piece. I really like the heavy weight of the leather that Larry uses as it just gives the feeling that it will last forever. It is not real shiny and "beautiful", like those custom holsters that take weeks to get, but it is heavy, sturdy and holds the gun like a tight fitting glove. 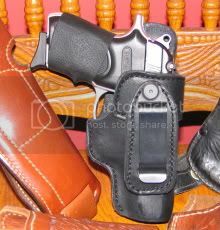 After carrying this holster for just a weekend it has already begin to form into my body and when I found the sweet spot I locktited the screw on the adjustable clip and it stays exactly where I want it and quickly disappears into my daily activities and noone ever knows I have a Bersa 380 in the waistband of my pants simply hidden by a heavy t-shirt. It is cool around here this past weekend so I have switched to the heavy longsleeve tshirts I love to wear in the cold months. I really enjoy carring my Bersa when I need a change from carrying the XD subcompact and this new holster from Tennessee Holster is going to be the way to go. 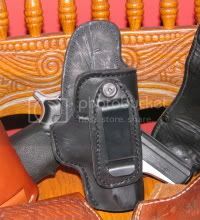 I got an email from Isabel, Larry's better half, earlier and she said the Beras Holster has been added to the website and is now available for sale. She also used my picture which made me feel proud to be helping out these good Southern American citizens make a living in these tough econmic times. I'm loosing my job at the end of the year due to the tough economic times in our country and while I'm drawing my six weeks severance package I would like to plan a trip up north from me to Tennessee to see how these nice folks make their fine quality Gun Holsters. Check out Tennessee Holsters and give them some business if you can.